I just love this time of year. Not for the cold temperatures (eeeeeek, it’s been a long winter already and it’s only December! ), but for the warmth that accompanies it >>> for the cheerful giving and holiday gatherings and all the wonderful festive food and bevvies. One of my all-time favorite appetizers during the Christmas season is a shrimp dip that my mom is famous for. I’ve been enjoying dipping crackers into it for as long as I can remember; Christmas Eve would not be the same without it! 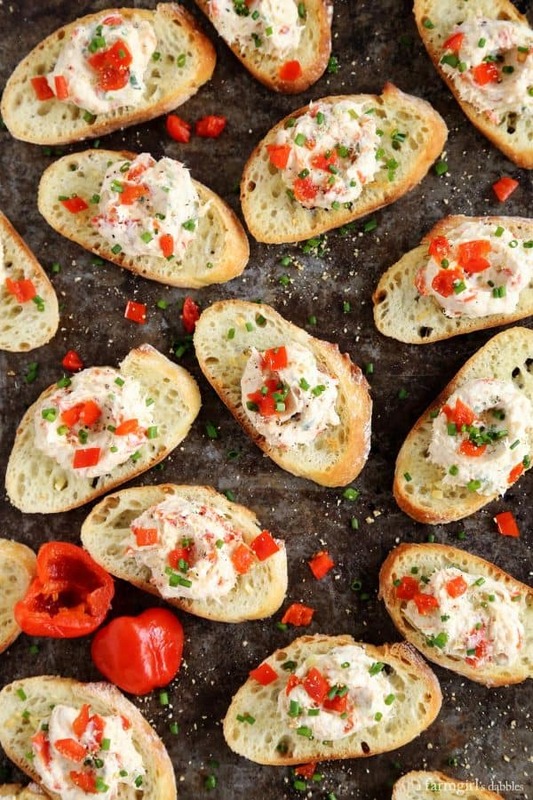 This recipe for Creamy Shrimp and Peppadew Crostini has taken my mom’s shrimp dip to a whole new level. It’s amped up in flavor and just a bit “fancy”. I just know you’re going to love it! I always stock up on cans of shrimp from Chicken of the Sea right before the holidays and football season. Between Mom’s shrimp dip, my aunt’s layered creamy chili shrimp dip (it’s so fun and pretty, you just have to take a look! 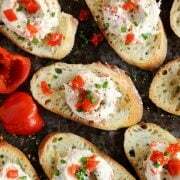 ), and now this creamy shrimp and Peppadew crostini recipe…I simply must always be prepared to create something delicious for a gathering of friends and family. Do you know about these Peppadew peppers that I included in this recipe? They are small piquanté peppers grown in South Africa. The seeds of this vibrant red pepper are removed and then the peppers are pickled and bottled. I was first introduced to Peppadews on a pizza, where I immediately fell head-over-heels for them. They are bright and tangy and sweet, with just a bit of fire in their bite. Look for them in your grocery store’s bulk olive buffet or in jars in the deli and cheese area. When I was creating this recipe, I wasn’t really thinking about how the colors would be so Christmas-like, with obvious red and green. This appetizer was meant for the holidays! 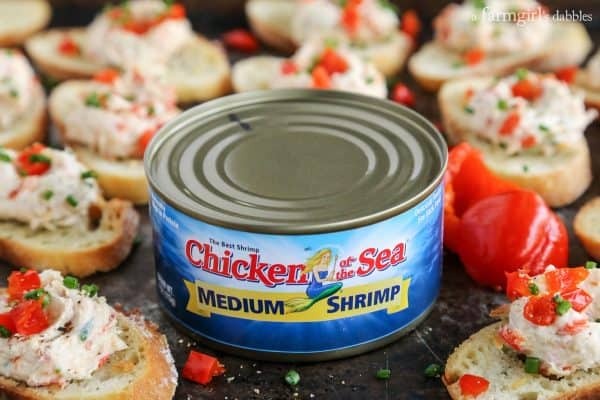 Chicken of the Sea offers shrimp in tiny, small, and medium sizes. While I chose to use the medium size shrimp in this recipe, any size will do. All of these sizes will give you that wonderful shrimp flavor that you’re craving. Slice baguette diagonally into 1/4″ thick slices and set aside. In a small bowl, stir together butter, olive oil, and chopped garlic until combined. Spread onto one side of each slice of baguette. Place baguette slices onto one or two baking sheets, buttered sides up. Bake for 10 to 12 minutes, or until golden and toasted. Remove from oven and allow crostini to cool on baking sheets. In a medium bowl, stir together cream cheese and mayonnaise until well blended. Stir in half of the chopped shrimp, and then the chopped peppers, green onion, lemon zest, salt, and pepper. Then lightly fold in the remaining half of the chopped shrimp so there are noticeable chunks of shrimp. Spoon a bit of the creamy shrimp and peppers mixture onto each piece of crostini. Top each appetizer with some additional chopped peppers and the sliced chives. Sprinkle lightly with additional freshly ground black pepper if desired. 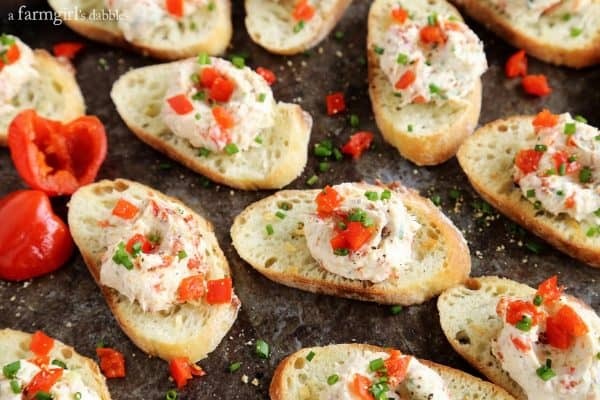 An alternative to this recipe would be to serve the creamy shrimp and pepper mixture as a dip, with the crostini on the side. This would also work great with your favorite crackers and/or fresh veggies for dipping. Chicken of the Sea has just recently rolled out new packaging (see below). 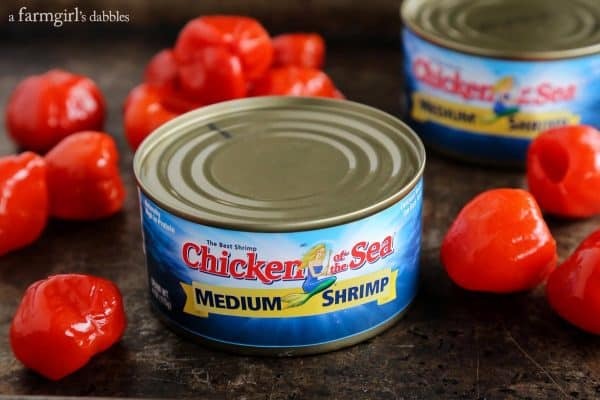 Look for their shrimp in a store near you and connect with them on their website and social media channels: Facebook, Twitter, Pinterest, and Instagram.